The largest Atlantic storm ever? Where do they find people to write garbage like that? How big was the 1780 Great Atlantic hurricane which killed 23,000 people? Hurricane Andrew had wind speeds 300% of Sandy. 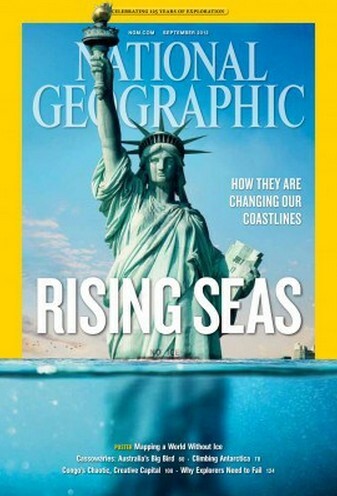 Sandy’s flooding was a storm surge, not sea level rise. Where do they find people to write garbage like that? The Climate Commission has been concerned about misleading information in the media in recent weeks stating that the Earth is not warming. 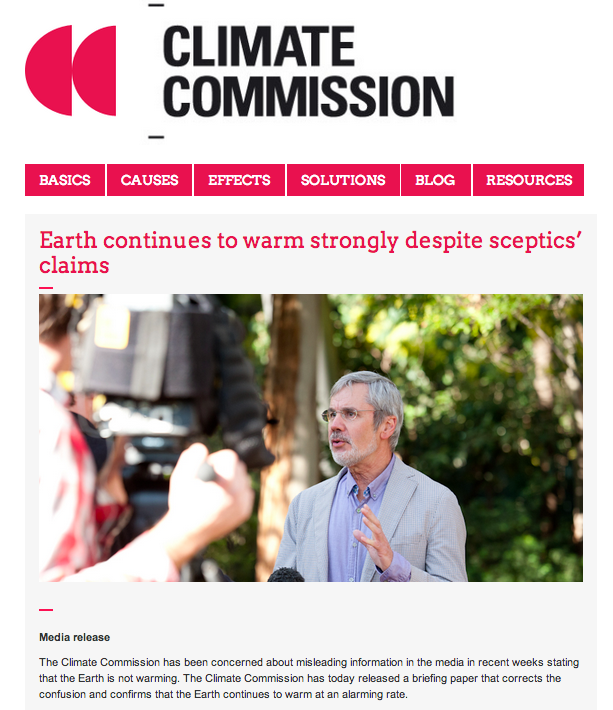 The Climate Commission has today released a briefing paper that corrects the confusion and confirms that the Earth continues to warm at an alarming rate. The Earth continues to warm strongly. 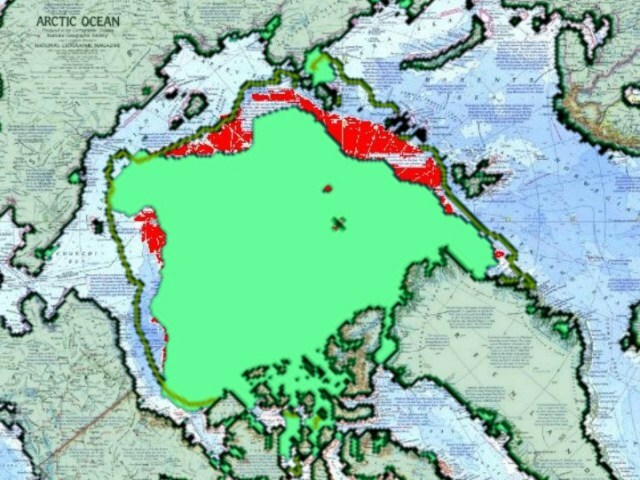 Scientists assess this based on long term observations of the heat content of the ocean, the air temperature (an indicator of the heat content of the atmosphere), and the amount of heat absorbed by the land, glaciers, ice sheets, and sea ice. 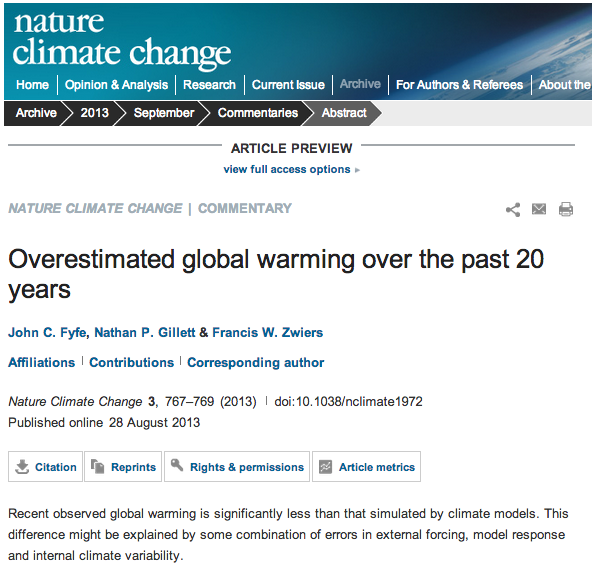 Understanding changes in climate requires data over long time periods, at least 30 years and preferably much longer. The best measure of global warming is ocean heat content as it absorbs nearly 90% of additional heat trapped by greenhouse gases. Global ocean heat content has increased substantially over the last 40 years, and the strongly upward trend has continued through the most recent decade up to the present. Singling out short term trends in air temperature to imply that global warming is not occurring is incorrect and misleading. ACC Claim: Singling out short term trends in air temperature to imply that global warming is not occurring is incorrect and misleading. Atmospheric surface temps have been used and marketed since the end of the last global cooling phase from 1945-1976 and explicitly through the 1990′s as the definitive measure of human-induced (anthropogenic) global warming. NASA’s Goddard Institute for Space Studies (GISS), former directer James Hansen, and the British Hadley Centre for Climate Change, have consistently promoted the use of surface temperature as a metric for global warming. The highly publicised, monthly global surface temperature has become an icon of AGW alarmist projections made by the IPCC. The ACC contests that short-term trends are misleading, however the entire anthropogenic global warming scare was predicated on only 22 years of atmospheric warming from 1976-1998. 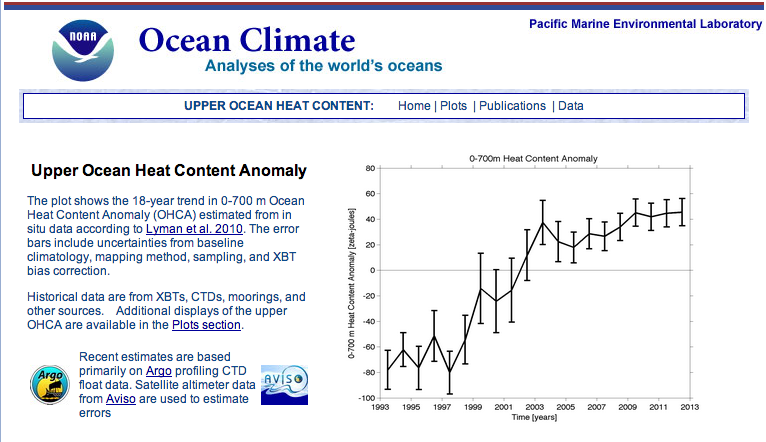 Back then air temp data was in fashion, now that air temps have not risen over the past 15-17 years, global warming alarmists deny and reject them and now claim the ‘missing heat’ is hiding in the oceans! 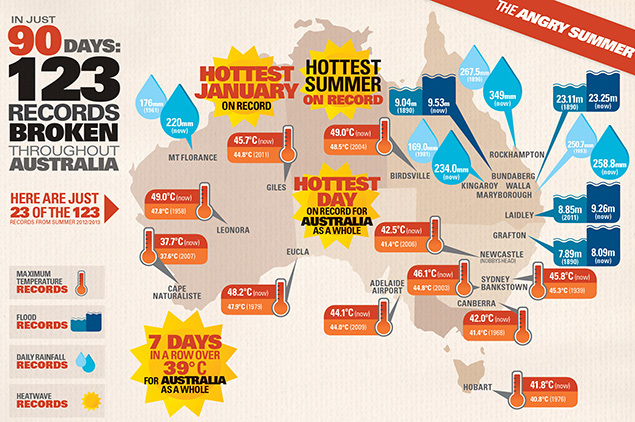 It’s official, the past 12 months have been the hottest in Australia for more than a hundred years. Temperatures averaged across Australia between September 2012 and August 2013 were hotter than any year since good records began in 1910. 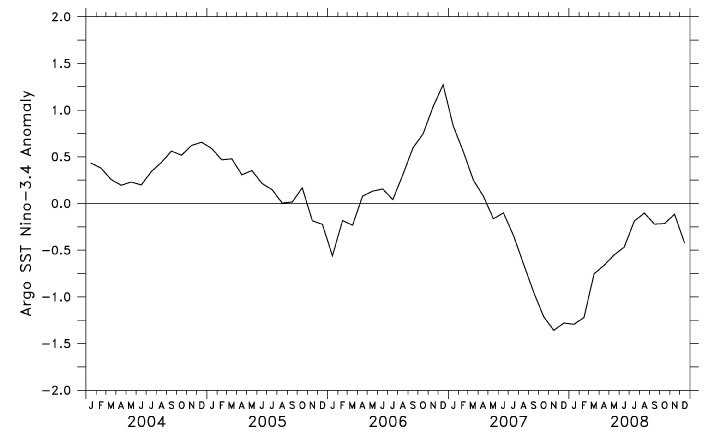 The previous record was held by the 12-month period from February 2005 to January 2006. Dr Sophie Lewis is from the University of Melbourne and the ARC Centre of Excellence for Climate Systems Science. David Karoly is a Professor of Atmospheric Science in the School of Earth Sciences and the ARC at the University of Melbourne and is a member of the Science Advisory Panel to the Australian Government’s Climate Commission. The Climate Commission was setup by the Australian Labor Government in 2011 as an ‘independent’ body communicating on climate change. Rather than behaving independently, it has acted as a literal climate propaganda unit to promote the Governments sweeping climate reform agenda, with the controversial carbon (dioxide) tax as it’s centrepiece. 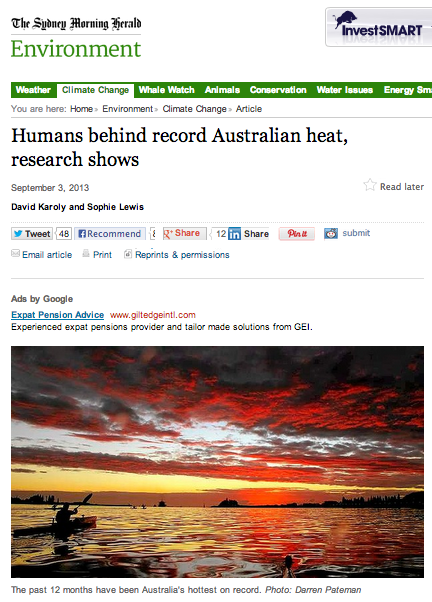 To push the man-made global warming narrative, Karoly and Lewis consistently cherry-pick ‘heat records’ from Australia’s 21st century climate. The Climate Commission’s alarmist report, “The Angry Summer” was another case in point. What’s immediately telling in Karoly, Lewis and the Climate Commission’s work is the lack of any reference to satellite temperature data, which would be pertinent to assessing Australia’s short and long-term climatic trends. 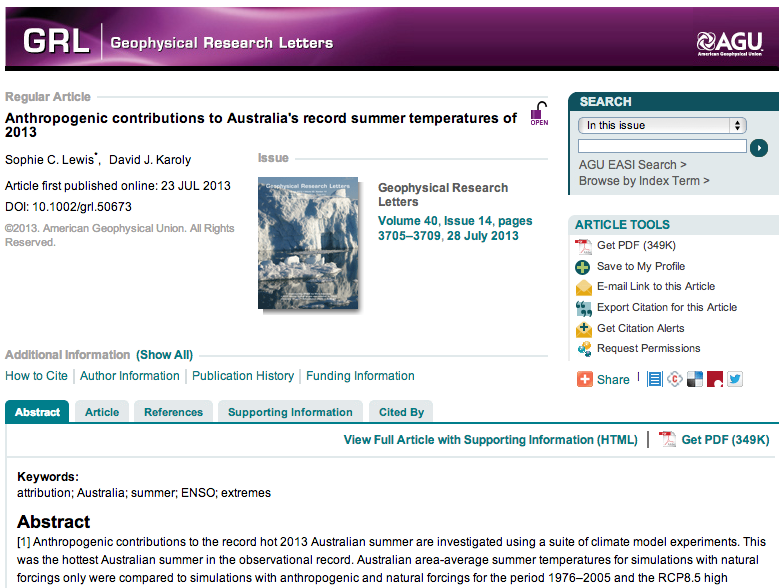 If the satellites showed that the last Australian summer was hot, would Lewis and Karoly have left them off the paper? There is a perfectly good reason why Karoly, Lewis and the Climate Commission do not include satellite data in any of their reporting ~ because the data does not fit their alarmist ‘extreme’ heat narrative. 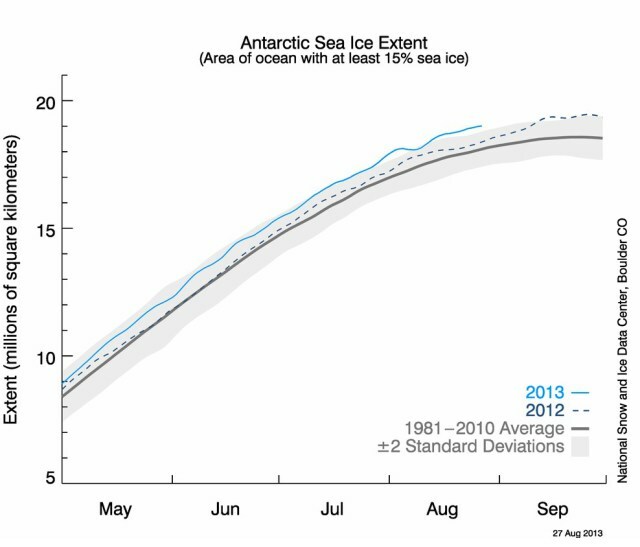 In fact the satellite data shows a trend in the opposite direction. The latest UAH satellite temperature dataset shows Australia’s near surface temperature (0-5km) has been cooling at -0.927°C per decade over the last 5 years and cooling at -0.291°C per decade over the last 10 years. 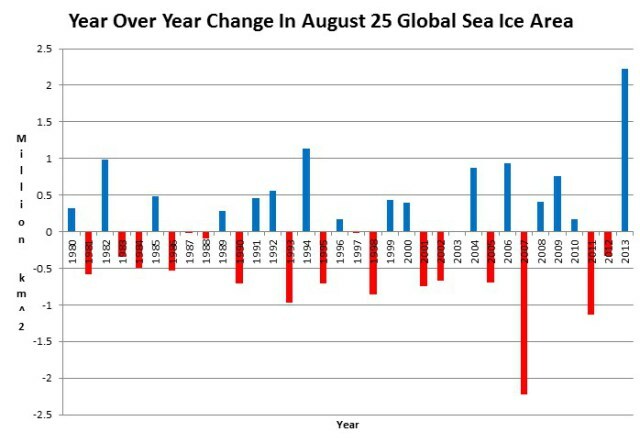 Both satellite datasets agree that there was nothing at all unusual about the 2012 summer. Did Karoly and the Climate Commission researches notice this fact? Or perhaps they just thought it wasn’t important for their report? The peer reviewed, comprehensive, Lewis and Karoly paper does not contain the words “satellite”, or “UAH”. Lewis and Karoly apparently do not know about the UAH satellite program yet, otherwise they surely would have emailed John Christy or Roy Spencer (as we did) to ask for the data. We can only hope that they get enough government support, more funding, and better education in future so that they may discover what unpaid volunteers figured out on the Internet for free 3 months ago. Frankly it is shameful that the Australian Research Council (ARC) Centre of Excellence for Climate System Science is not connected to the world wide web and has not trained staff to use “google”. If humans are making a substantial addition to a ‘warming’ climate, then why has the temperature of the globe not changed in 15-17 years despite a massive increase in human CO² emissions over the same period? 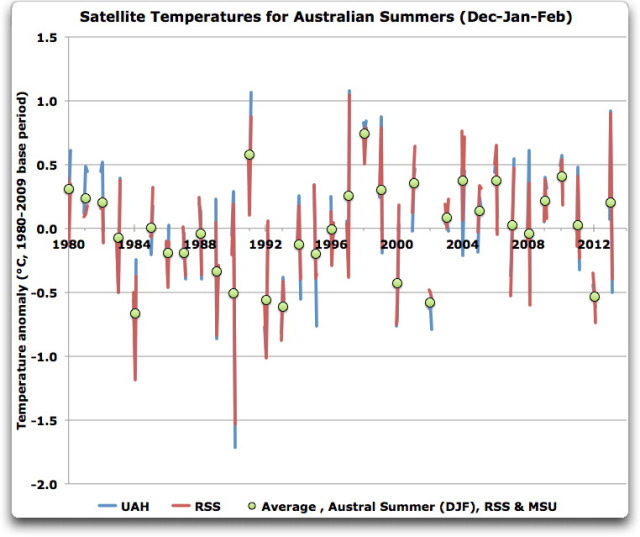 Why has Australia’s mean summer surface temperature not changed since 1979? 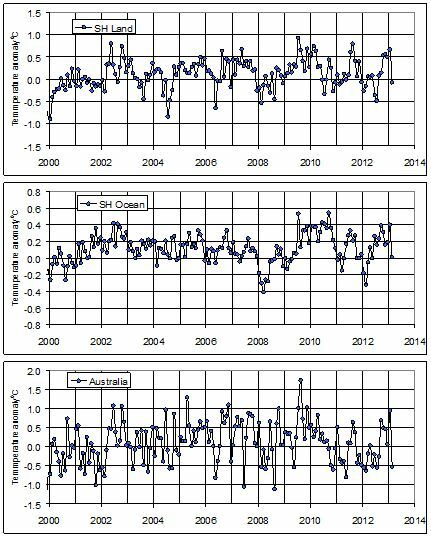 How do the researchers reconcile human induced climate change (warming) based on Australian ‘weather’ over a few months of a year? 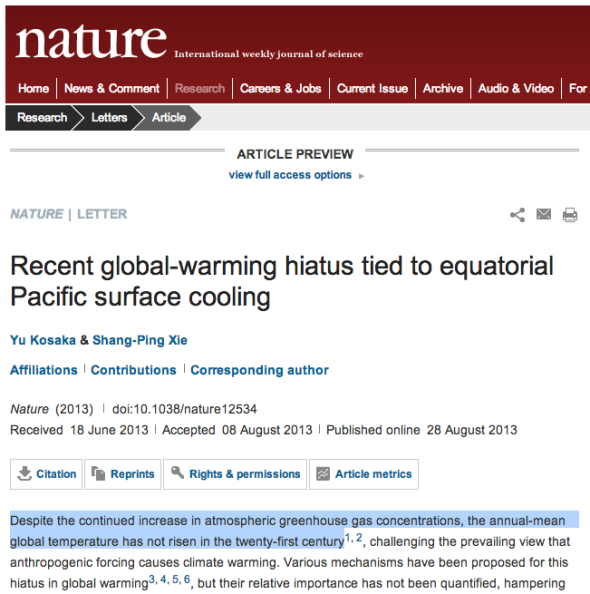 Isn’t global warming a global ‘climate’ (30-year-cycle) issue? These are mere basic scientific questions the Climate Commission should be using taxpayer funds to answer, not cherry-picking often UHI (Urban Heat Island) affected temp station data and suspect Bureau of Meteorology (BOM) temperature calculations to promote a Government climate agenda and massage an ideological climate bent.